Put a pot on high heat with the olive oil. When the oil is hot, add the onions and cook, constantly moving, until they're very soft. Approximately 3 minutes. Add the rice and let fry in the oil for 5 minutes. Pour the water and add the pepper, mexicorn, garlic salt and consommé, stir well. When the water has boiled, lower the heat, cover the rice and let cook for approximately 20 minutes. I recommend checking on it after 18 minutes to make sure the water has not entirely evaporated, this way you'll avoid having the rice stick to the walls of the pot. Just be sure not to mix the rice with a spoon, as this will only weigh it down. If you need to see the bottom of the pot simply insert a spoon in the middle and move to the side. If you note that the water has evaporated, but the grains of rice have not fully cooked, add a quarter cup of water, cover and check again in 5 minutes. Poblano peppers are known as pasilla peppers in the United States. Peel, roast and chop the peppers in advance to save on time the day you make the rice. I grew up eating rice almost every day. This grain, along with beans and tortillas, make up the most of the Mexican diet. We eat so much of it that we've found different ways to prepare it. My mom generally served it white or Mexican style with tomato broth. On special occasions we liked to vary it a bit, for example, in September we celebrate independence, so we like to prepare white, red and green rice to resemble the Mexican flag. During Easter, we always prepare rice to be combined with all the other dishes our family prepares for this celebration. 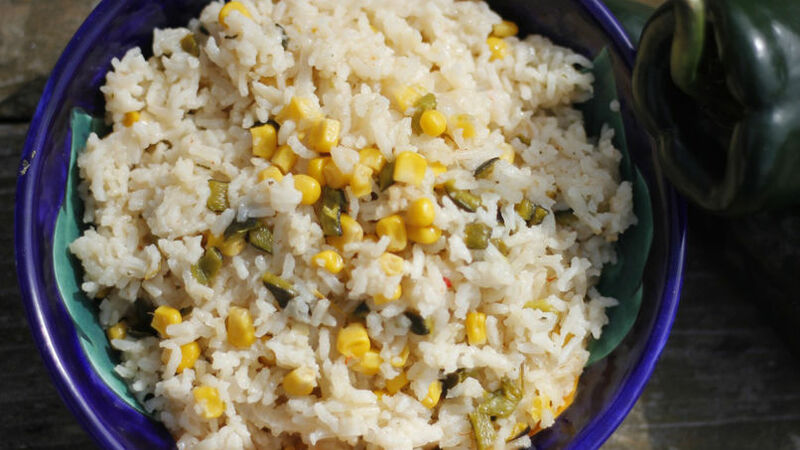 The recipe I share with you today has a white rice base, but its flavor changes the moment you add the poblano peppers and corn.